Stiga Collector 53 SB sláttuvélin er með drifi, létt og öflug. Góð sláttuvél með drifi fyrir meðalstóra og stóra garða. Vélin er afturhjóladrifin og með B&S 190cc úrvalsmótor. Sláttubreidd vélar er 53cm og hæðin er hækkanleg í einu handfangi. Collector 53 SB vélin er með legum í öllum hjólum. Er því þægileg í notkun og fylgir vel grasfletinum í slætti. Graskassinn er 55 lítra stór, aftan á vélinni. Vélina má einnig nota án kassans, þá slær hún grasið aftur fyrir sig niður á blettinn. 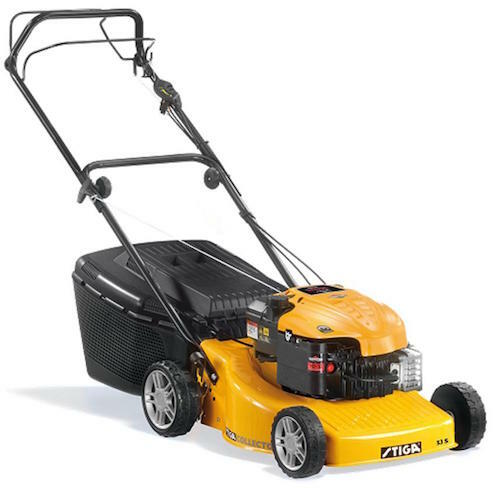 The Stiga Collector 53SB lawnmower is designed for medium to large sized gardens. Powered by a Briggs & Stratton 625 Series 5 HP engine, its self-drive transmission allows for maximum control with minimum effort. It comes equipped with a 53cm steel deck featuring a single lever centralised height adjustment system which boasts a cutting height range from 30mm to 75mm. The Stiga Collector 53SB lawnmower is also an extremely versatile machine as it offers a 2 in 1 system for cutting your grass. Firstly, it comes with a rear discharge system which simply allows the grass to fall to the ground when cut. Secondly, its collection facility features an impressive grassbag capacity of 55 litres. It also features centralised height adjustment.